„super zoom“ is looking for you! As part of the show the two African actors Mmakgosi Kgabi and Awelani Moyo – along with one guest judge per evening – will be looking for an Austrian superstar, who is fit for the future. At this Casting-Show, which is part of the performance, somebody will have the opportunity to win € 500,- in cash. Africa invests in Austria, its sons and daughters. People, who would like to participate, click here for more information. Marco Schreuder im Gespräch mit Vanja & Peter Fuchs über „pink zebra theatre"
Marco Schreuder im Gespräch mit Vanja & Peter Fuchs über ihr Theater- und Performance-Label pink zebra theatre, aufgezeichnet am 21. Juli 2011 im Café Jelinek in Wien. 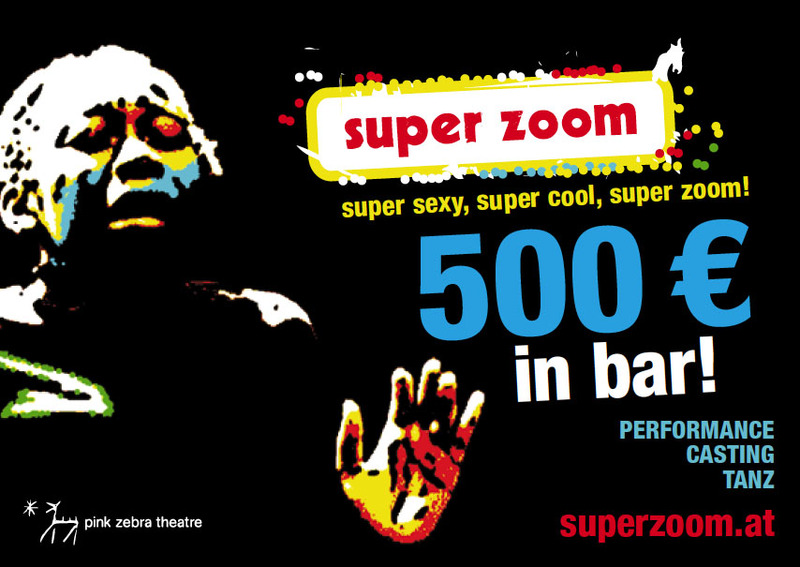 The performance „super zoom“ from Africa is guest in the theatre „Dschungel Wien“. The European debut performance takes place on the 19th of August. From the 19th to the 23rd of August 2011 the African artists Mmakgosi Kgabi und Awelani Moyo are visiting Vienna. The both of them are bringing checks, Dollars, Euros, Pounds, Rands and diamonds as they intend to purchase crisis-ridden Europe.